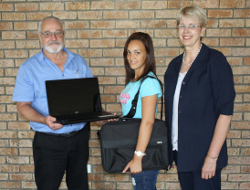 The Microsoft Technology Associate (MTA) course at Northlink College Tygerberg Campus received laptops as well as laptop bags as part of their course and the new laptop initiative started by the College. The group of IT students from the Northlink Microsoft Academy has been given these laptops that has been installed with the latest ICT software that will enable the students to not only practice what they have been taught in the class, but will give them the opportunity to get to know the technology that they will be working with first hand. Says Ina Louw, HoD: Blended Learning at Northlink College: “We are glad that we, with the help of this initiative, are able to not only give the students the hands-on experience that they need with the latest in technology and software but also give them the opportunity to grow and better their future in the ICT industry with this course.” Some of the other advantages of laptops in the Education Sector are that they (laptops) are seen as cognitive tools that are integrated into the teaching and learning of an FET College. The “paradigm shift” resulting from laptop implementation fostered more higher-order reasoning and critical analysis skills among students and greater lecturer-student collaboration around instructional tasks. • Use educational social media etc. “We are looking to take this new technological methodology of teaching to our other courses,” adds Louw. This initiative will not only allow the College’s students to be more mobile but truly give them the upper hand when applying for a vacancy due to this personal, in-your-face interaction with the software and hardware that industry requires.